This spacious and light-filled guest room had two queen-sized beds. The homeowners wanted to provide accommodations for their guests to unpack, settle in, and feel at home. The primary guests who come to stay are their two grown daughters, both of whom have small children. When the guestroom was not in use, they wanted a quiet, serene space with an updated feel. My job was to use my imagination, come up with something interesting, and take this room from ho-hum to eye catching. We needed drawers for clothing, but we didn’t need to recreate a bureau. Instead I got rid of the legs by hanging the unit up off the floor. This creates a sense of spaciousness and modern utility, and leaves room to slip a pair of shoes underneath when needed. In addition, the visual openness of a floating unit makes the room feel larger. With the TV mounted on the wall above, the whole effect is clean, contemporary, and ready for company to settle in and relax. But what if they needed to work while they were here? For that, I turned to the other wall. Since there was significant space between the queen beds, I created a dual-use area. Side tables at the height of the mattress-top are a must. Guests want to keep their phone–which doubles as an alarm clock–close at hand, along with a glass of water and maybe a book for evening reading. Having those along with lighting that you can turn off from bed is a thoughtful touch. So is the electrical outlet built into the top of the side table. No more crawling around on the floor, looking for a place to charge those electronic devices! But if the side tables are at bed height, what about the desk? To bring that up to the proper height for writing and computer work, we used 6-inch stand-offs in satin nickel to raise the glass top. 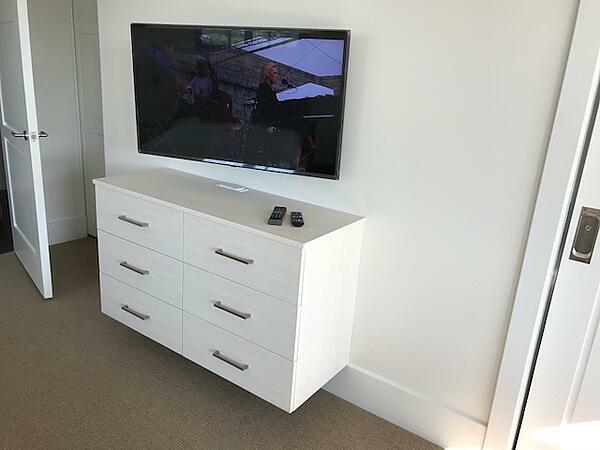 It makes a stunning statement, especially when combined with the Bianco Laminate finish on the drawer units and the matching drawer pulls. 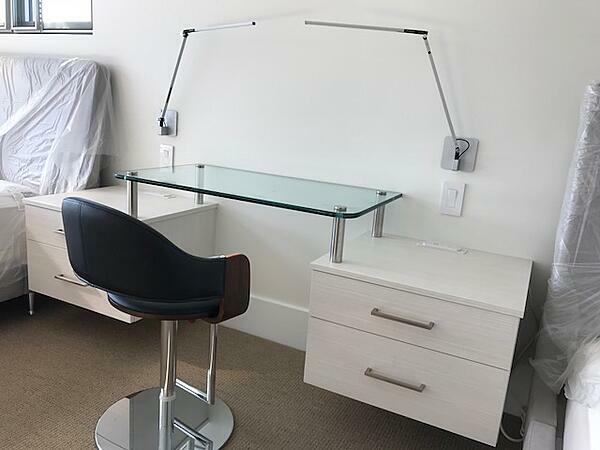 The LED lights adjust to light the desk as well as the beds, allowing a streamlined look combined with ease-of-use. 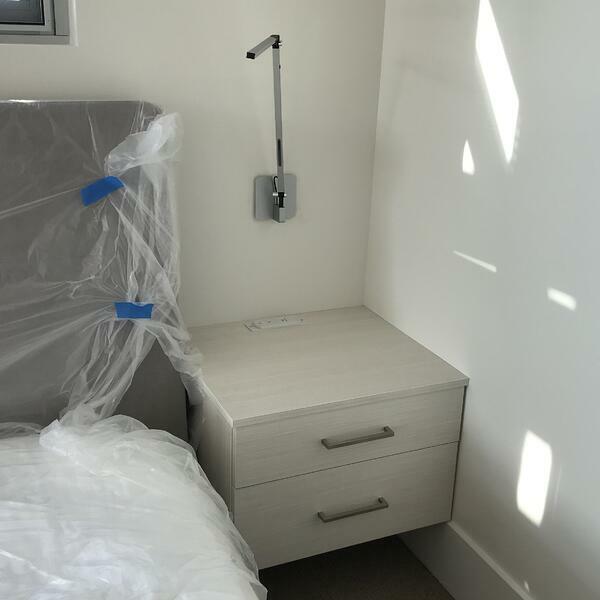 The homeowners were delighted with the effect of the two simple yet elegant Valet units that made their guest room into a place where their family can kick back and relax, or maybe get to work in a stylish and fresh space. They can enjoy the thoughtful and welcoming touches each and every time they visit. Mission accomplished! Ward entered the custom cabinet business in 1984 when he joined his father at Eurodesign. After selling Eurodesign to Valet in 2005, Ward joined the Valet team as Manager of Engineering and Product Development. Today, he continues to provide support in these areas while also contributing as a valuable member of our design team. Ward and his wife Nancy are longtime residents of Los Altos. Ward enjoys meeting with customers bringing 25 + years of design and engineering expertise to his work.